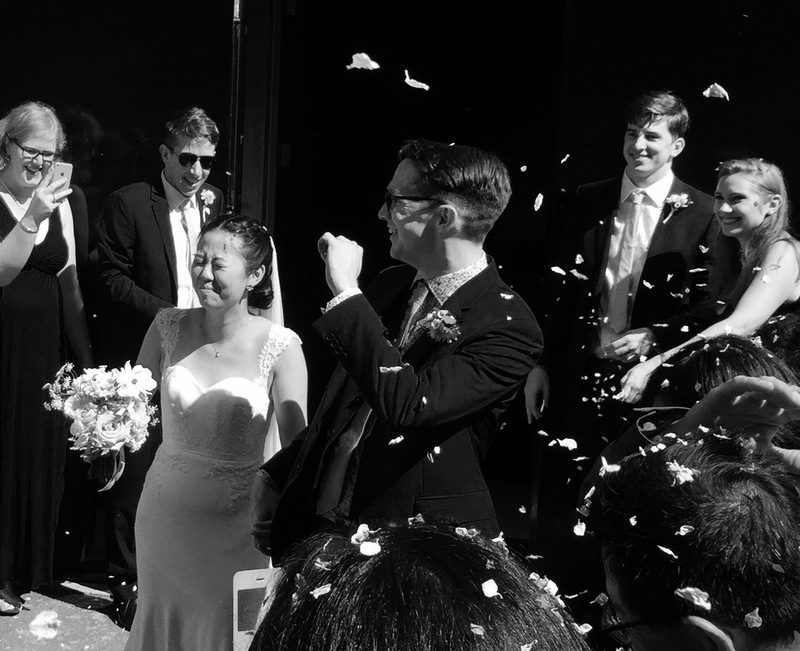 I recently returned from the fun and pleasure of a family event in London - the wedding of our son to his beautiful wife. iPhone in hand I began the process of carefully shooting each photo, sending them in email batches to my son. What seemed daunting and overwhelming at first soon gave way to a free-fall down the twists and turns of memory lane. happily forget about the broken down cars, the rainy summer holidays, pimples, scowls and so much more. The photos I take now are so very different. Or are they? inseparable companion. For better and worse. I didn't take it to the wedding. And that was OK. I had my iPhone for the occasional shot. the camera. And that's OK too. That photos - the good, the bad and the ugly, along with a camera, any old camera, could do so much. Sweet memories for you Kathy, congratulations and best wishes for your growing family! What a lovely post, Patti. Thank you! What better way to get to know a new place than through the eyes of the people. I find it interesting, to on occasion though, to put down the camera and immerse myself in the event on hand. A funny sort of freedom – although catching those moments on film can be just as freeing… Sounds like you had a wonderful trip. We have finally joined Eric in the Middle East for a spell so am trying to find my way here and hopefully will in a while ‘find my camera’ too! Meanwhile I will be enjoying Autumn in New York via your lens Patti. How exciting for you to be together and in such an exciting location. Am sure you will eventually find your camera Gil but until then, and in the meantime, I know you will enjoy taking the time to “case the joint.” And thank you so much for your kind words! My pleasure Pierr and thank you! Love the photo. The lighting really worked… and the spirit of the moment came through beautifully. Your reminiscence came through too… Happy for you on the joyous occasion. Thank you so much Shimon, an unbelievably bright and very warm sunny day in London! What a beautiful post. Rings true to me, Patti. Whenever I wonder about taking all those photos, I look back on the memories, the slide shows and images and see how recording it all is worth every click. Congratulations on your son’s marriage and on this wonderful celebratory image. Thank you so very much for your kind thoughts Jane and you keep clicking! What a beautiful and honest post Patti. The camera really can be a companion, and those moments and observations captured can otherwise sometimes be lost. The pleasant surprise of rediscovering those almost lost memories, and in the slow time when it was all film . . . . Thank you Teresa, here’s to camera companionship! Congratulations! I thought you were way too young to have a grown son! Time to confess to liberal use of Photox – painless and without side-effects. Thank you EF for your kind words! Didier, what to say . . . . celebrating the therapy! So wonderful and moving. Thank you for the words you found which speaks in a way for us all! So happy to be in such good company, thank you Markus for your kind and supportive words! Interesante “terapia” la de revisar, de vez en cuando, las antiguas fotos. Nos recuerda como éramos antes y a la vez nos hace comprender, que de alguna manera, en el fondo no hemos cambiado tanto. Saludos y enhorabuena por la boda de tu hijo. So well stated and absolute gratitude to you Leo, thank you! Congratulations on this joyous event, Patti. Photographs should stir the emotions. This is one of their primary purposes. And there is a time to enjoy the moment and leave the photography to others. You make a salient point Lignum about photographs stirring the emotions and I find that, often, it is one simple photo that sets the pot stirring for the narrative of that moment to start rolling. And yes, happy to leave the photography to others. Thank you! Beautifully put. And a brilliant shot! A truly beautiful post in so many ways-so well written, touching and true. Very best and Congratulations to all. Elena, I think I’m going to cry . . . thank you! So good to hear, thank you Pat! I so agree with you Robert, the power of the print really does pack an extra emotional punch. I recently bought a Canon Selphy which prints 4 x 6 wirelessly and have been so happy with it, thoroughly recommend it! Cliched to say Elina but . . . . . they grow up so quickly, even if it doesn’t feel like it at the time! Thank you so much for your sweet words and my best wishes to you and your family for the now days and the many ahead! beautiful Patti; really like the movement and contrast – the newlyweds will love it! I hope they like it, thank you so much John! Beautiful post, Patti and in so many ways! Lovely shot. Have a great weekend. That’s so kind of you to say, thank you Richard and wishing you a great week-end – albeit a week later! Big congrats and a very articulate post. Back to simple shots soon, thank you so much Mark! You sent me sniffling down (my) memory lane with your beautiful post Patti. Congratulations to your son and his lovely wife! I’m so sorry Madhu, I didn’t mean to make you cry but that memory lane and what it does . . . . Big thank you! Your words “a free fall down the twists and turns of memory lane” are wonderful. As is your image, Patti. Congratulations to your son and his bride. You’ve captured such happiness! My absolute pleasure and thank you so much Laurie! Your description so vivid of your sifting through the years of memories-my heart can feel it, too! And now Ruth you have all your gorgeous grandchildren adding to the memories, and aren’t they growing so quickly! Patti you have touched on the very essence of your photographic work with your words – our shared humanity. Whatever the setting, close-up, familiar, distant, ‘alien’ we are there with you. Thank you so much Philippa for your company and most kind words! Thoroughly enjoyable read Patti and you have a captured a precious moment. You are very welcome Patti and I hope you have a great weekend . Weddings are so full of emotion aren’t they . . . . thank you Martin for your kind words! Slowly getting back into camera action here in NYC while still trying to work the backlog from last summer and in-between. Hope your team is doing well so far this season! Al the best to you Patti, and your growing family. So grateful, thank you kindly Allan! You’ve caught everything here Patti, and words straight from and to the heart as always..
Touching words Cath, thank you so much! Margie, late getting back to you and your comment – what an exciting week-end for you and the happy couple. Congratulations and am sure you all had a wonderful time celebrating in beautiful northern Michigan. More happy family times ahead! Ah Patti, I just love this post. For so many reasons. Mostly though, thank you for being so generous with your thoughts, very personal ones. I’m happy for you for attending the fin event and for not bringing your camera. That was wise. The years have their gifts. The years do indeed have their gifts and thank you so much Lyn for the lovely thought! What a beautiful and moving post Patti. I have one in primary and one just started secondary and I’ve been feeling thoughtful about that transition. My littlest is now 8 and I’m watching her playing make believe games with her toys, now, more than ever. I’m watching so closely because I know that in such a short time, these days will be over and only memories. My favourite saying lately “realise deeply that the present moment is all you ever have” Give me a shout when you’re back in the city, coffee is on me! I’m hopefully going to meet Uday when I’m in Delhi next. Nice to meet fellow photographers! Those childhood days, which seem so long at times, disappear so quickly into the years don’t they! I remember one of my boy’s frustrations when he hit the teens was the feeling that he couldn’t play with his toys anymore, he was so sad about it. As you so well say, “the present moment is all we ever have” and with the realization of such we hope the making of rich memories continues. Wishing you and Uday all the best in Delhi and am sure you will come back with more excellent shots. Thank you so much for the coffee offer Peter, love to! Congratulations on your son’s wedding Patty. Always a memorable occasion. It seems like only yesterday that I cut my first daughter’s umbilical chord with a steady, yet moved hand. And less than two years that she got married. Then last wednesday, starting dinner with my wife, we hear a key in the house door. Hmmm? Our two daughters with their respective husbands-boyfriend “dropping by” for a surprise dinner, bringing fondue cold meats. Great. Opened a few bottles, and when we were all settled daughter #1 took out an ultra-sound (echography?) and put it on the table. A future new member of the family’s first – bean-looking – photo. Congratulations and how exciting for you all! Those years whizz by don’t they . . . . and now the next generation for you to enjoy. Wishing your daughter good health and many more happy family times ahead!